Some of the most beautiful and significant words that could be spoken to anyone. And how very special they were when spoken to a man dying for his sins. Both the criminal and Jesus were looking beyond their present circumstances, beyond the pain and the slowly approaching death. They were moving away from the crowds into another space. And here Jesus could promise the man not just a relief from pain, nor a misty vision of some lovely garden, but the incredible promise that they would be together. Nor was the promise for some unknown date in the future with all the years of darkness still to pass. This was a promise not for tomorrow but for ‘Today’. 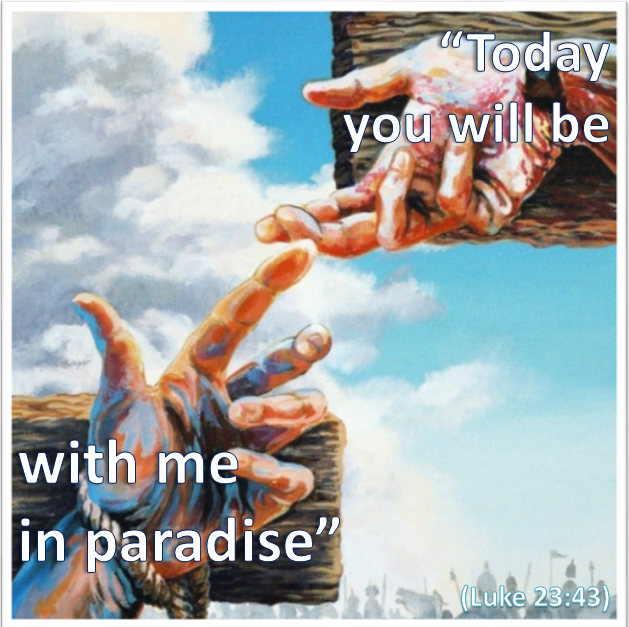 It was as if Jesus were saying to the man that as death claimed him in this world Life would open out before him in the world to come – and Jesus would be there with him to carry him through and into His eternal presence. We are not told of the man’s response, but Peter Marshall interprets it like this. He might well not have understood what was going to happen or what it would be like. However the promise that he would be with the Lord, wherever He was, was more than He could have expected or imagined. What amazing grace! And what a beautiful promise for you and for me to hold on to when our time comes. Categories: Christianity, Daily Life | Tags: Cross, Daily Bread, Grace, Jesus, Lent, Luke, Scripture | Permalink.